CLW Real Estate Services Group has been working with Visual Realm for the past 5 years on numerous projects. 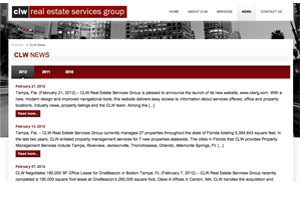 As one of the elite front runners in commercial real estate services CLW wanted a top-of-the-line web site to combine their six main areas of business and replace their currently outdated flash site. The new clwrg.com combines function with aesthetic. It features a fully updatable Content Management System (CMS), variety of JQuery effects, a blog with newsfeed functionality that displays on desired sections of the web site and seamlessly integrates with CLW’s 3rd party listing company. 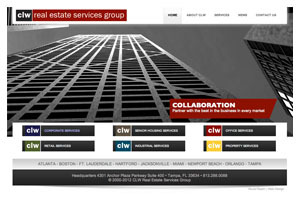 The site was built to be internally administered by CLW employees with little or no web development knowledge through a web based user interface. The new CLWrg.com is also compatible with smart phones and tablets as well as cross platform on all major internet browsers. To check out all the other cool new features on CLWrg.com please visit our portfolio here.